Have you ever gotten that eerie sense of captivity from an older record? There’s just something about the way that the voices of Marvin Gaye or the Four Tops radiates through the vinyl cracks and grasps any listener that many people think modern artists simply cannot replicate. To that, we only have one thing to say: you clearly haven’t seen a live Fitz and the Tantrums set. 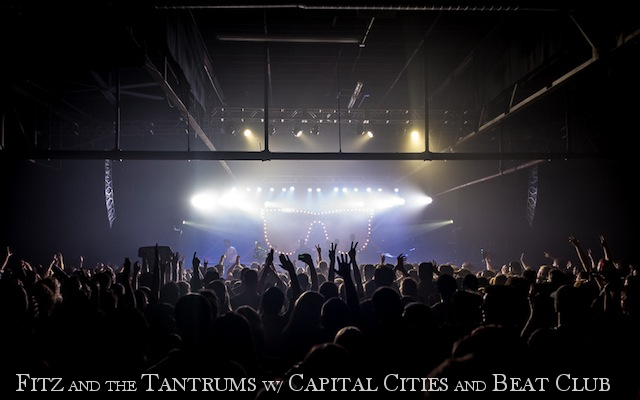 We got the pleasure of checking out (and taking tons of photos of) the Fitz and the Tantrums set last Thursday at Marathon Music Works, and we haven’t been able to stop raving about it since then. You can read our full review below, and check out some stellar photos by Shawn Jackson. …that is until these stellar musicians began the last song of their set, ironically titled “Relax”. This stunning track blends a spot on Ramones attitude with the same orchestral synth tones and Beat Club feeling from before. Trust us, it’s a wonderfully potent mixture. Since we were first exposed to this track live, we haven’t been able to stop listening to it. Suffice it to say, Beat Club threw down that night. Next up was Capital Cities, who were responsible for the undeniably catchy track embedded below. Go ahead, play the video. You absolutely need to hear this trumpet line. You might also notice the fact that literaly everybody is dancing in their video; this is a trend we noticed during their show as well. In fact, Capital Cities actually did a great job of tacitly teaching their audience some basic dance moves for each song, which fostered an incredibly high amount of artist-fan interaction. Honestly, this little talent of Capital Cities is very likely the reason they’ve experienced as much success as they have. Sure, the music is really great, but every member of this LA based duo (and the three additional live members) was so undeniably fun. Capital Cities is, quite simply, an act it’s impossible not to like. Capital Cities may have set the bar quite high for Fitz and the Tantrums, but there was never a doubt in anyone’s mind that the six piece act from LA (noticing a trend here?) would live up the hype. After all, the clean sounds of soul revival that Fitz and the Tantrums have released via their two full lengths never fails to get people dancing. However, even those of us expecting to enjoy their set were blown away by how tight the band was. The communication between each member of the band was incredibly obvious, but of particular note was the warm relationship between singers Michael Fitzpatrick and Noelle Scaggs. Each of these two talented vocalists took their turn at soaring melodies and played off each other quite nicely. The set featured a mixture of songs from their newest record, More Than Just a Dream, and hits from their debut album. And yes, they played “Moneygrabber”. How could they not? All in all, this was one of the best shows Marathon will put on this month. We sincerely hope you were there, but if you weren’t, check out these photos, which were taken by our very own Shawn Jackson. Even if you did come, it wouldn’t hurt to take a look at these awesome shots.